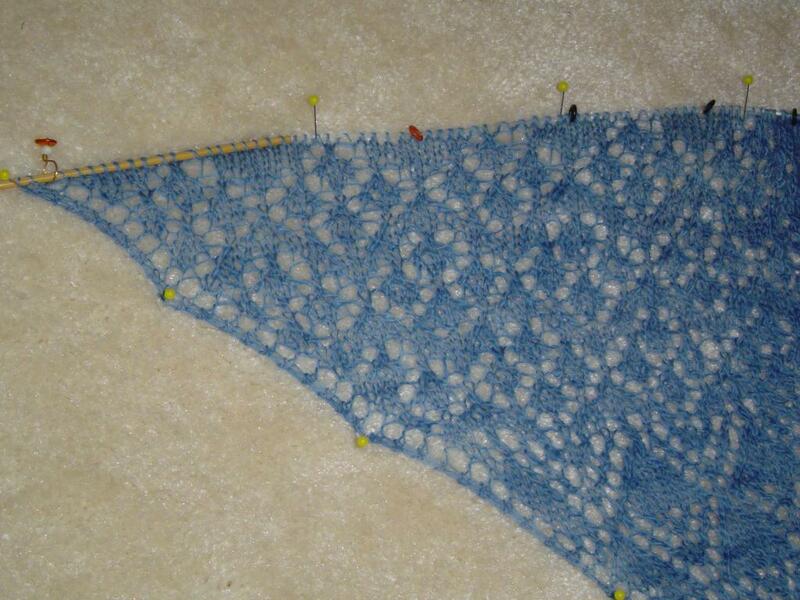 Well, I finished Step 3 of the Mystery Shawl. 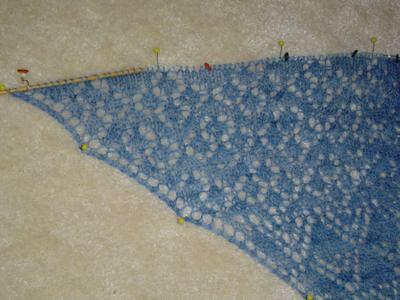 It is now 279 stitches across. This clue made a lacier pattern. It looks like little sets of diamonds separated by zigzaggy lines. I loved knitting this part. The patterns were very easy to memorize - perfect for knitting in front of the TV in the evening when my brain just doesn't want to think anymore. We get Step 4 on Friday and I can't wait to see what Renee has designed for us next. So far, I haven't had any trouble keeping up with this and I must say, its really been fun to do. I love not having to think about what I'm knitting - since I have no clue what I'm knitting, and getting the instructions piece by piece means I can only do so much at a time so I don't have a huge project hanging over my head. Now it gets put away until Friday, and I can work on one of my other projects completely GUILT FREE! Melanie that's lovely! I'm still halfway through clue 2 ... sigh. Had to put it on a time out. Maybe today it will behave ... LOL. Really nice. I'm at the same point as your last commenter -- although mine is now behaving and is not in time out. Hopefully on to clue 3 soon.